As a former marketing operations manager, I naturally gravitated towards reviewing a book on Social Media ROI. After all, business practices are driven by ROI and marketers are facing increased pressure to show accountability. Olivier Blanchard’s book is helpful in integrating social media with business objectives and he brings social media to life with many interesting situational narratives. Blanchard blends these worlds into a cohesive strategy and journey consisting of investment, action, and reaction—leading to nonfinancial and financial impacts. It’s a nicely constructed methodology that remains focused on ROI. Organizations that embrace social media properly, Blanchard explains, will benefit from enhanced collaboration, increased departmental efficiency, cost reductions and business growth. He instructs the reader on how to present a business case across the C-level executive suite in a context that matters to each stakeholder. Without securing buy-in, a social media initiative is dead in the water. The book’s Table of Contents is well organized and broken out into 4 sections on how to become a social company: social media program development, program integration, program management, and program measurement. 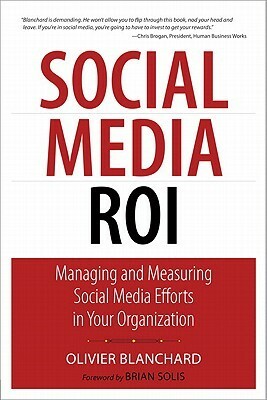 Interestingly, the ROI section doesn’t take up most of the book, but is filled with good insights, including a comprehensive guide on how to overlay program data onto a single timeline to glean insight on how social media is contributing to business objectives. I also like his two page list of everything you can possibly measure, along with an interesting approach on micro and macro metrics development. I was surprised to read that the recommended overall campaign results analysis be done manually, using a simple correlation approach to social media initiatives. I was expecting something more scientific and black and white, but perhaps Blanchard is realistic in how difficult it is to prove cause and effect for everything we do in marketing. I believe content marketing could have had more visibility in Blanchard’s book. It does go hand in hand with social media marketing with the dual purpose of driving website traffic and continuing the engagement process. Good content is essential for building credibility, trust, and thought leadership with customers. This is particularly important for business to business vendors. Blanchard makes reference to an appealing methodology called F.R.Y. that he learned from a Microsoft initiative for the SMB marketplace. F.R.Y. stands for frequency, reach, and yield—and provides a common language for sales, marketing, and other departments to use for goal attainment. The premise is to get customers to buy more often, find new net customers, and increase the size of an average order. This is more appealing for business managers than simply hearing the social media manager wanting to increase brand awareness. According to Blanchard, social media creates a new world order for marketers, PR, and brand managers. In the past, corporate communications was only one-way formalized communications and had customer response times usually measured in days. The new social web creates a new paradigm with two-way conversations and many new channels to reach audiences. Reach can be amplified many times over, both directly and laterally, across a customer’s social network. The community now defines the brand. Today, everything in corporate communications begins with a “listening” post for monitoring brand mentions, sentiment, velocity, volume, and more. The “word cloud” has become a common instrument for marketers to visually depict engagement. A corporate crises situation can now occur in literally minutes and go viral on the Web. For instance, Blanchard references the well known “United Breaks Guitars” protest song by Canadian musician Dave Carroll. Crises management and reputation management are the new battle grounds for protectors of corporate brands—the crises team is always at the ready to respond. Blanchard devotes an entire chapter to customer service and discusses how social media can reduce costs, build customer engagement, and enhance a brand. He rightly espouses that customer service representatives should be empowered to address customer issues and complaints directly. Many other business functions can also benefit from social media programs: Sales can more easily acquire new customers and develop relationships via social engagement; LinkedIn is the new standard for HR recruitment; and Business Intelligence (BI) benefits from the vast amounts of available social and transactional data. By reading Social Media ROI, marketers will be better equipped to develop social media program strategies that integrate well with existing communications; increase the velocity of prospects moving down the marketing-to-sales funnel; and build more “social equity” for long-term customer relationships. Blanchard frequently emphasizes the word “social” in social media and the need for more “humanized” business interactions and communications. When corporations adopt social media best practices, Blanchard explains, customers now have a voice and an opportunity to engage more intimately with brands like never before. Social media is indeed all about two-way conversations. This entry was posted in Social Media and tagged content marketing, FRY, Marketing ROI, social equity by irvingfrydman. Bookmark the permalink.